The Bank of America Center, 700 Louisiana, will gain 35,000 SF of space. HOUSTON – (Realty News Report) – The old and almost forgotten Western Union building, which has been encased and hidden since the 56-story Bank of America Center tower was completed in 1983, is being opened up and redeveloped. 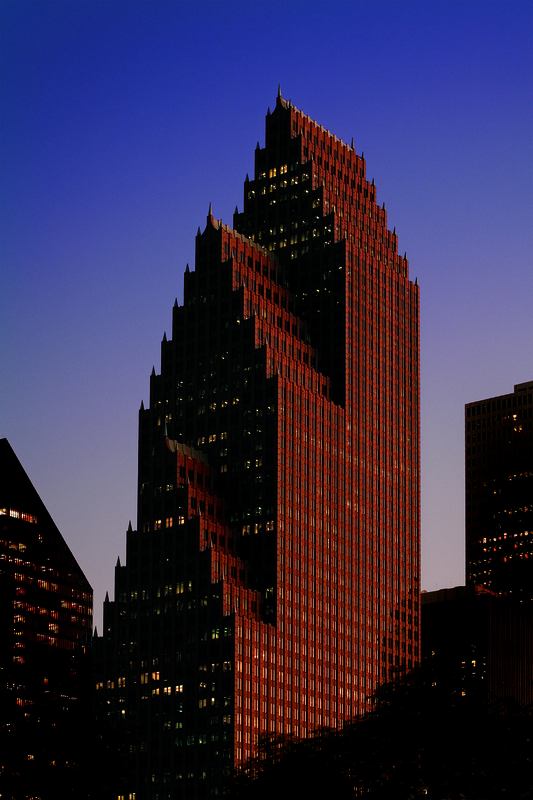 The renovation of the Western Union space will add some 35,000-SF to the Bank of America skyscraper, providing room for a new white table-cloth restaurant and other lobby improvements, says Ken Moczulski, founder and CEO of Houston-based M-M Properties, which owns the building. The 1.2 million SF building, 700 Louisiana, was developed by Hines and designed by Philip Johnson and John Burgee. Bank of America will be moving out of the building to occupy a new tower developed by Skanska. HFF’s Cameron Cureton and John Brownlee recently arranged a refinancing of the building, which is near the Theater District. Bank of America and CBRE will be moving their offices out of the building, which is one of the most recognizable towers on the skyline. The tower has ANR (TransCanada) as a main tenant. The building, which has a red granite exterior, was known as RepublicBank Center when it opened. The Western Union building was retained and enveloped because it many electrical connections.